A Georgia Institute of Technology research team has devised a novel way to help keep a driverless vehicle under control as it maneuvers at the edge of its handling limits. The approach could help make self-driving cars of the future safer under hazardous road conditions. Researchers from Georgia Tech's Daniel Guggenheim School of Aerospace Engineering (AE) and the School of Interactive Computing (IC) have assessed the new technology by racing, sliding, and jumping one-fifth-scale, fully autonomous auto-rally cars at the equivalent of 90 mph. The technique uses advanced algorithms and onboard computing, in concert with installed sensing devices, to increase vehicular stability while maintaining performance. 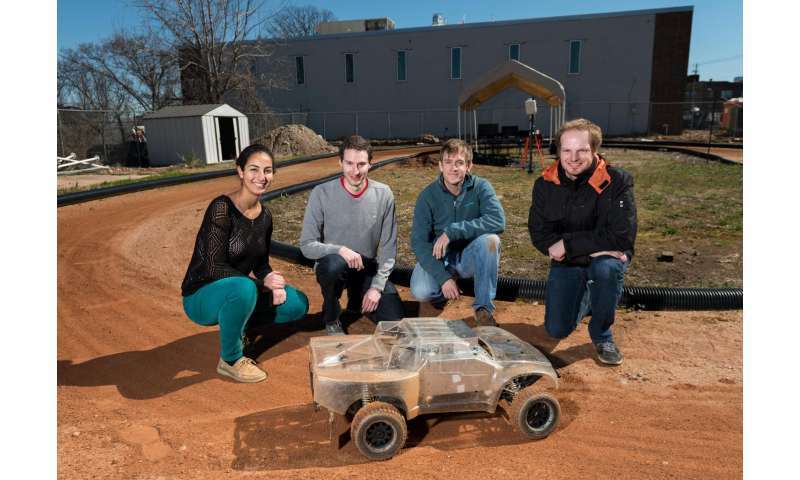 The work, tested at the Georgia Tech Autonomous Racing Facility, is sponsored by the U.S. Army Research Office. A paper covering this research was presented at the recent International Conference on Robotics and Automation (ICRA), held May 16-21. "An autonomous vehicle should be able to handle any condition, not just drive on the highway under normal conditions," said Panagiotis Tsiotras, an AE professor who is an expert on the mathematics behind rally-car racing control. "One of our principal goals is to infuse some of the expert techniques of human drivers into the brains of these autonomous vehicles." Traditional robotic-vehicle techniques use the same control approach whether a vehicle is driving normally or at the edge of roadway adhesion, Tsiotras explained. The Georgia Tech method - known as model predictive path integral control (MPPI) - was developed specifically to address the non-linear dynamics involved in controlling a vehicle near its friction limits. "Aggressive driving in a robotic vehicle—maneuvering at the edge—is a unique control problem involving a highly complex system," said Evangelos Theodorou, an AE assistant professor who is leading the project. "However, by merging statistical physics with control theory, and utilizing leading-edge computation, we can create a new perspective, a new framework, for control of autonomous systems." The Georgia Tech researchers used a stochastic trajectory-optimization capability, based on a path-integral approach, to create their MPPI control algorithm, Theodorou explained. Using statistical methods, the team integrated large amounts of handling-related information, together with data on the dynamics of the vehicular system, to compute the most stable trajectories from myriad possibilities. Processed by the high-power graphics processing unit (GPU) that the vehicle carries, the MPPI control algorithm continuously samples data coming from global positioning system (GPS) hardware, inertial motion sensors, and other sensors. The onboard hardware-software system performs real-time analysis of a vast number of possible trajectories and relays optimal handling decisions to the vehicle moment by moment. In essence, the MPPI approach combines both the planning and execution of optimized handling decisions into a single highly efficient phase. It's regarded as the first technology to carry out this computationally demanding task; in the past, optimal- control data inputs could not be processed in real time. 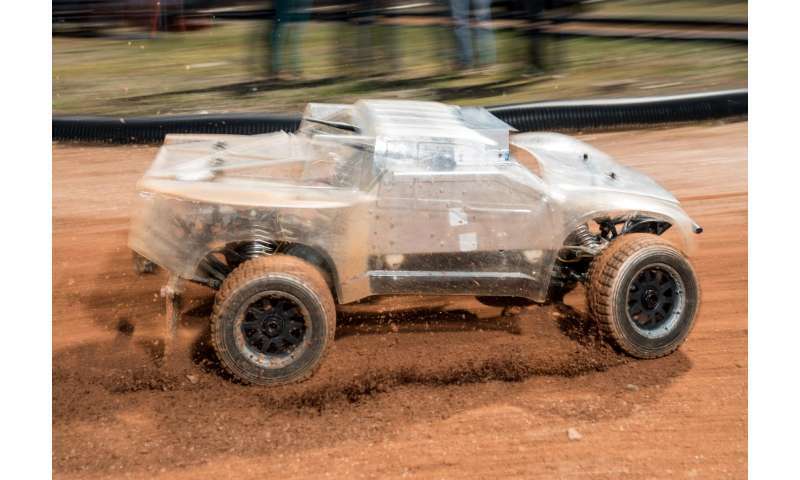 The researchers' two auto-rally vehicles—custom built by the team—utilize special electric motors to achieve the right balance between weight and power. The cars carry a motherboard with a quad-core processor, a potent GPU, and a battery. Each vehicle also has two forward-facing cameras, an inertial measurement unit, and a GPS receiver, along with sophisticated wheel-speed sensors. The power, navigation, and computation equipment is housed in a rugged aluminum enclosure able to withstand violent rollovers. Each vehicle weighs about 48 pounds and is about three feet long. These rolling robots are able to test the team's control algorithms without any need for off-vehicle devices or computation, except for a nearby GPS receiver. The onboard GPU lets the MPPI algorithm sample more than 2,500, 2.5-second-long trajectories in under 1/60 of a second. An important aspect in the team's autonomous-control approach centers on the concept of "costs" - key elements of system functionality. Several cost components must be carefully matched to achieve optimal performance. In the case of the Georgia Tech vehicles, the costs consist of three main areas: the cost for staying on the track, the cost for achieving a desired velocity, and the cost of the control system. A sideslip-angle cost was also added to improve vehicle stability. The cost approach is important to enabling a robotic vehicle to maximize speed while staying under control, explained James Rehg, a professor in the Georgia Tech School of Interactive Computing who is collaborating with Theodorou and Tsiotras. It's a complex balancing act, Rehg said. For example, when the researchers reduced one cost term to try to prevent vehicle sliding, they found they got increased drifting behavior. 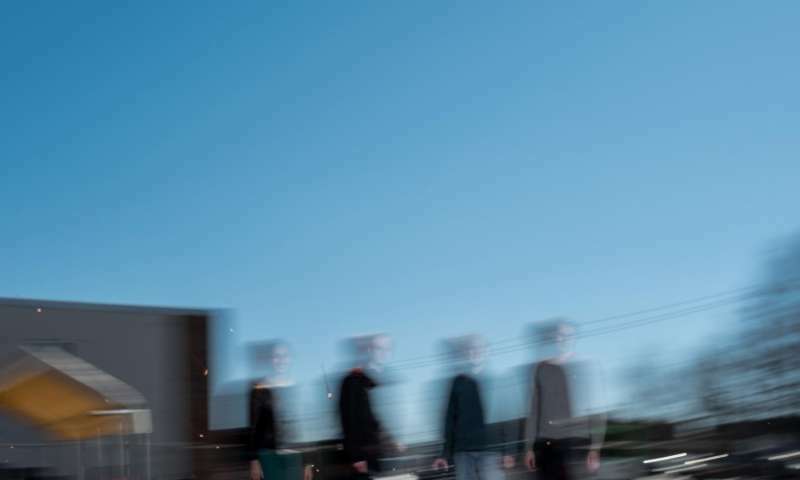 "What we're talking about here is using the MPPI algorithm to achieve relative entropy minimization—and adjusting costs in the most effective way is a big part of that," he said. "To achieve the optimal combination of control and performance in an autonomous vehicle is definitely a non-trivial problem." How soon until we have the Robot Racing League?